Know your dog. If your dog is hyper in the car, plan on some sort of restraint. A portable dog kennel or gate will keep the dog safe and prevent him from driving. Dogs love to drive. They're lousy at it. They are good at distracting you when you are driving. Prepare accordingly. A little training also goes a long way. Whatever you do, don't travel with a dog who hates the car. You'll end up hating the dog, yourself, the car, travel, and the world in general. Start small. You might not be as lucky as we've been. Try an overnight trip, close to home, for a start. Don't take your dogs along if they'll just be in the hotel the whole time. If they can't have some involvement they'd probably be happier at home. You'd be surprised at the number of places where well behaved dogs on leashes are welcome. Ours have even visited two small museums! A little research beforehand can prevent disappointment, and ensure a good time - for everyone. Plan ahead, especially in peak travel times. Many hotels/motels will take pets only in off-peak times. Some only allow small dogs. Some allow only one dog per room. It is often possible to negotiate. Tell the proprietor what you will do to make sure the dogs cause no trouble or damage - then be true to your word. Think convenience. First floor motel rooms with doors leading directly to the outdoors are usually preferable. Phone ahead and ask if there's a dog walk area. You don't want to be wandering around a strange town at night looking for a bit of grass. I've done it. It's not fun. Think safety. Keep your dog on a leash! Strange surroundings can override basic training. Why risk having your pet lost, hurt or killed. Also remember, not everyone likes dogs (hard to imagine, I know). A strange dog, running loose, can cause outright panic in some. I love dogs, but even I don't like to see one off lead and headed toward me and my small dogs. Please respect the rights of others so everyone can have a good time. Think twice before you leave a dog alone in a car and NEVER leave a dog in a car in hot weather. Dogs can, and do, die quickly in hot cars. Dogs (especially those with short muzzles) are much less efficient at cooling than humans. What is just uncomfortable for you can be very dangerous for your pet. In cool weather, we have left the dogs in the locked car while we had a bite to eat or stopped briefly to buy supplies, but we always cringe. If possible, park the car where you can see it from a window for peace of mind. It's a calculated risk - children may stick their fingers in the window and be bitten, the dog might become stressed and damage the car or himself. 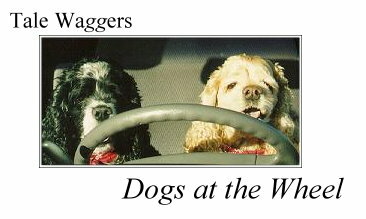 Active dogs might accidentally (sure, that's what they'd like you to believe) put the car in gear. Be prepared to feel worried and guilty while running back to the car every 10 minutes. Watch for children! Dogs are "kid-magnets". At festivals, parks, and rest stops they swoop down and wrap their arms around your unsuspecting dog. Your dog may take offense or panic. Keep an eye out to avoid potential disasters. This is also a valuable opportunity to educate children (and their parents) on how to approach a strange dog. Invest in a collapsible dog kennel. Train your dogs to accept being in the kennel. Take it with you. If you need to leave the dogs alone in the room while you eat or attend dog-free functions, they will be much safer and the hotel management will be much happier. You do not want the maid to open the door and set your dogs free in a strange town. You can also set up the kennel in the shade while you picnic or play games. Pack water from home and bring your dog's regular food to avoid stomach upsets. Resist the urge to treat your dog with human food. Carry the food and water in the car so you can feed the dogs at their regular time even if you want to stay out late. Carry a portable water bottle for the dogs if you will be hiking with them. Providing fresh water at regular intervals will prevent them from drinking from stagnant puddles or other unsafe sources. Even moderately active dogs need lots of fresh water, especially in the summer. Bring toys. Just like kids, dogs get bored in the car. Chew toys from home provide activity and comfort. And remember, everybody loves dog biscuits (for different reasons, of course). Keep some handy and the dogs will be less likely to eat your maps. Be considerate! Pack cleanup supplies. We carry baggies and tissue for waste removal. Unless your dog leaves a deposit in an area where no human will ever walk - clean it up. Even dog lovers hate poop on their shoes. We also pack carpet cleaner and a rag, in case of accidents of the tummy, bladder or bowel. A few old towels thrown in the car can be used to wipe sand or mud off feet or dry waterlogged pups before they enter your car or hotel room. Tell the maid there's a dog in the room (in a kennel, please). No need to scare the dog and the maid. We usually just tell them to skip our room if the dogs will be alone. We also give the front desk our cell phone number in case a barking episode erupts. We've never been called, but you never know how the little dears will react to all the strange surroundings and sounds. Prepare a small first aid kit to carry in the car. Tweezers (for ticks, thorns and pine needles), gauze (for cuts or a makeshift muzzle in case disaster strikes), and antiseptic are a good start. If you have a dog with health problems, consider a little research about vets in the area you'll be visiting - just in case. Healthy Pet has a hospital finder on their web site. Don't forget to bring any prescriptions along with you! Remember those heartworm pills? Doggie medications aren't always easy to get on short notice. Pack those pills! ENJOY YOURSELVES. If this all sounds like more trouble than it's worth, then it probably is. Board your dog and go alone. If you are mentally figuring where the kennel will fit in your car, then you're ready. There are many joys and happy moments to be found in travels with dogs. Have a wonderful trip! Looking for accommodations that accept pets? Being a proud dogmama, I must brag a little here. For several years, Motel 6 used the picture from this article on their web site and on their brochures. Every time I went into a Motel 6, there were the smiling faces of Arthur and Tristan greeting me from the "we're pet friendly" brochures on the counter. Of course when I told the counter clerks that those were my dogs in the photo, they looked at me like I was crazy. At least Tristan and Arthur got their 15 minutes of fame! Check out Dog Training Basics by Pam Young, LVT. She's kept dogmama from strangling darling Emma. She can help you! Even a little obedience training will make your life (and your dog's) much easier. Trust mama. Don't be outdone by a dog! See where Arthur has been: Visit MICHIGAN LIGHTHOUSES! He left his mark at many of them! Plan your trip and go have some fun!